Around 167 vehicles were controlled by 90 joint officers during Lintas Jaya Operation from Jalan Matraman Raya, Jatinegara, Jalan Soemarno Pulogebang and Jalan Raya Cacing, Cakung in East Jakarta, Wednesday (1/23).
" We do this to minimize illegal parking, vehicles stopping recklessly (ngetem), incomplete vehicle documents, contra flow, etc"
Those officers consisted of Transportation Sub-department, East Jakarta Traffic Unit, Garnisun, Indonesian Navy military police, Indonesian Air Force (TNI AU), and Indonesian Army (TNI AD). "We do this to minimize illegal parking, vehicles stopping recklessly (ngetem), incomplete vehicle documents, contra flow, etc," said East Jakarta Transportation Sub-department's Supervision and Control Section Head, Slamet Dahlan. 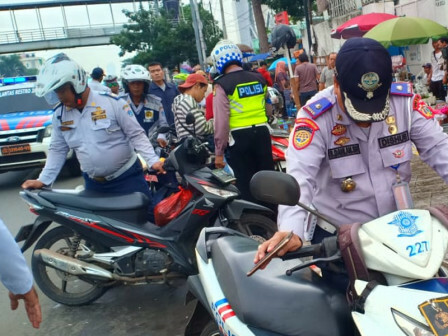 Of 167 vehicles, he detailed, 50 out of them were ticketed, 60 vehicles were ticketed, 8 motorcycles and 1 car were flattened when parking on Jalan Raya Matraman, Jatinegara, as well as 41 vehicles were towed, and 7 other units' operation was stopped due to incomplete documents.